Documented in the history books as the worst oil spill of all time, BP’s Deepwater Horizon explosion leaked a colossal 4.9 million barrels (over 200 gallons) of oil into the Gulf of Mexico. It was April 20th, 2010. It would be an entire 87 days before the well would be capped and years before all effects mitigated. Ironically, just one year prior , Greenpeace, an independent organization with the objective of exposing global environmental issues through “peaceful protest and creative communication”, awarded BP the first ever “Emerald Paintbrush” award. Sounds nice right? It’s not. 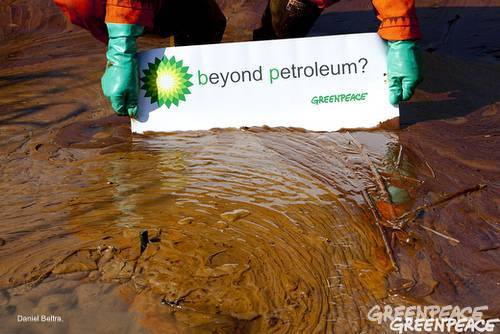 The “award” was bestowed upon BP in response to the company’s multi-million dollar marketing campaign in 2008. A campaign that asserted: “the best way out of the energy fix is an energy mix”. However, Greenpeace did a little digging and found a stark discrepancy between the company’s actual investments and its marketing claims. 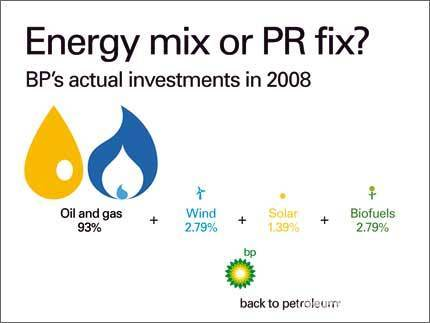 Despite the company’s assertion of a dedicated alternative energy effort, in reality, BP was allocating a mere 5-6% of its investments towards clean energy. Some dedication. As if the false advertising wasn’t clue enough, BP made its stance pretty clear in 2009 when the company terminated its solar projects in Spain and the U.S. Shortly thereafter, BP London office cut its entire alternative energy division. In 1Q 2010, BP generated approximately $73 billion in revenue. Of this 73 billion, 72.3 billion was the result of exploration and production of oil, with a mere $700 million of revenue from solar and wind energy. BP had long-operated with a desire to be branded “green”, launching an environmental campaign and completely rebranding in 2000. But the Gulf of Mexico spill should have been a surprise to no one given the company’s lengthy (and somewhat embarrassing) history of safety blunders. 2004: An accident at BP’s Texas City oil refinery results in 2 deaths, one injury, and $109,500 in safety violation fines for the company. 2005: An explosion at the Texas City refinery causes 15 deaths, over 170 injuries, and $22 million in fines. 2006: Over 200,000 gallons of crude oil leak onto Alaska’s Prudhoe Bay due to a puncture in BP’s pipeline. Months later, this same pipeline leaks an additional 1,000 gallons of oil. 2007: The Occupational Safety and Health Administration (OSHA) fines BP $2.4 million for safety violations at the company’s Toledo, Ohio refinery. That same year, John Browne resigns as Chief Executive (due to personal scandal) and is replaced by Tony Hayward. Four months later, BP agrees to pay $303 million to settle charges for manipulating the price of propane. 2009: OSHA revisits Texas City and fines BP an additional $87.4 million for safety violations. 2010: OSHA fines BP $3 million for its 62 safety violations at the Ohio refinery. Which brings us full circle to April 20th, 2010. Greenwashing is not a recent phenomenon. The term – a play on “whitewashing” (to gloss over wrongdoing) – originated in the 80’s at a time when claims such as “100% Natural”, “Organic”, and “Eco-friendly” became commonplace. So common in fact that companies were using these terms without validity. Following numerous customer complaints, the Federal Trade Commission (FTC) began investigating this “advertising pollution” and ultimately issued “The Guides for the Use of Environmental Marketing Claims” in 1992. The short-term effect was a decrease in greenwashing practices. The short-term effect was fleeting. In fact, greenwashing returned fiercer than ever and has sharply escalated in recent years. Why? The cause is two-fold. One, to appease the number of consumers increasingly mandating sustainable business practices; two, to avoid regulation. Greenwashing poses a tremendous threat to the environment and public health. Among the worst abusers are oil titans of the likes of BP, Shell and Exxon (surprise, surprise) – as well as producers of indoor cleaning products. A 2009 report by TerraChoice portrayed that of the 397 cleaning products assessed, 394 made unsubstantiated green claims. Makes sense given that in the early 1990’s a poll was released indicating that 77% of Americans relayed that a company’s environmental reputation affected their purchasing decisions. Greenwashing intensified so greatly in the 90’s that the term “Deep Greenwashing” emerged, broadly defined as a campaign to ease public apprehension, abscond blame from polluting corporations, and encourage voluntary measures over legitimate regulation. What does this mean for you? For one, confusion. It has become increasingly difficult for consumers to ascertain between companies genuinely committed to environmentally sound practices and those that simply have strong public relations divisions. But, in fact, it appears this is exactly what corporations are doing. As Guy Pearse (author of Big Brands and Carbon Scams) writes, “Toyota reckons Mother Nature drives a Prius, Ford wants us to ‘Join the Green Revolution’, and McDonald’s has painted its famous golden arches green. Facebook has even friended Greenpeace”. As consumers, and as ESG Vigilantes, we must keep a shrewd eye out for corporate embellishment. Government should go after these bad actors. Advertising products which are green that are not is illegal. It’s called fraud. Put a few of these fat cats in jail and that will fix green washing. Regulatory Capture at its best. Go get ’em sustainableinvestor. Agree with the commenters but, the problem is, it’s über difficult to get a fraud conviction. I think the best way to go is to put a price on carbon (carbon tax preferred). A company can say they’re green all they want but their carbon footprint is their carbon footprint. 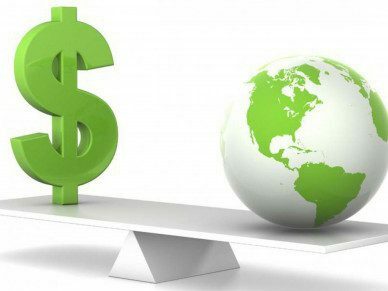 Beyond that, it’s blogs like Sustainableinvestor and others that will keep companies on their toes.